Irish supermarkets are continuing to show positive momentum, with Dunnes Stores retaining its place as the top grocer in the country, according to the latest market share figures from Kantar Worldpanel. 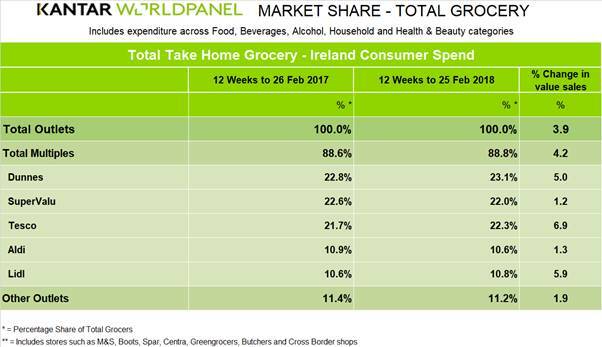 For the 12 weeks ending 25 February, supermarket sales growth was 3.9% in Ireland, with shoppers spending an additional €96 million on groceries compared to the same period last year. David Berry, director Kantar Worldpanel Ireland, said that this growth was driven by two factors. "First, shoppers are choosing to buy slightly more expensive items and this is reflected in continued sales growth for brands," he said. Grocery market inflation stood at 0.1% for the period. Irish retailer Dunnes Stores remains the top supermarket in the country, with 23.1% market share, after seeing 5% growth in the most recent trading period. However, second place Tesco was the fast-growing grocer, with sales increasing by almost 7% and market share hitting 22.3%. Close behind was SuperValu on 22% share. Looking at the discounters, Lidl was the second strongest growing retailer during this period, with sales up by 5.9%. Kantar Worldpanel says that this is due to an increase in shopper loyalty. Meanwhile, Aldi, which posted a rare decline in year-on-year sales in the Irish market last month, is now back on track, after seeing sales rise 1.3%. The retailer's market share now stands at 10.6% - just 0.2 percentage points behind rival Lidl.